The redevelopment of Westwood Shopping Centre has been successfully completed on programme. 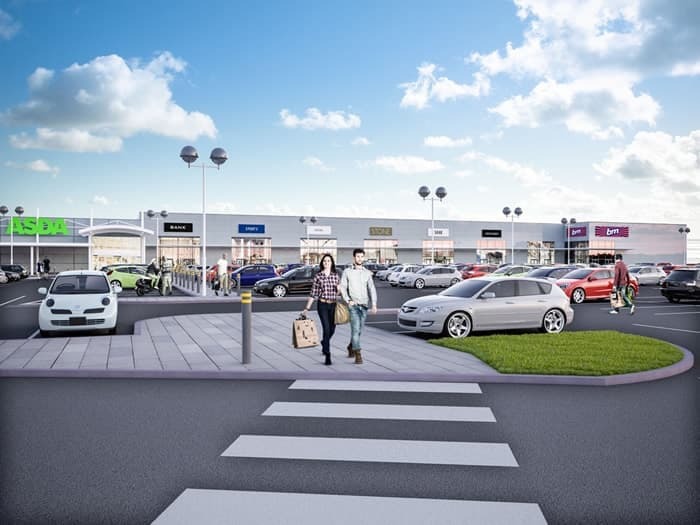 The works entailed the careful demolition of the existing malls, retail units extending to approximately 6500 sq/m whilst having to retain the existing suspended floor plate. Following works to the existing foundation structure a new steel frame was erected with the building now configured as 7no. independent retail units. Externally the building was clad with architectural wall panels with curtain walling to shop fronts, internally the units has a basic shell finish specification i.e. perimeter fair faced walls, screed floors. Works also included the upgrade of the existing drainage installations and resurfacing of the carpark which remained live throughout the over cladding of the existing Asda Store which also remained operational throughout. The successful completion of any project on programme and incident free and to a high standard is testament to the site team.